Local Relay for Life event held in McAlester, Oklahoma. On Friday evening September 27th, a team from Narconon Arrowhead participated in the annual Relay for Life event of Pittsburg County in McAlester, Oklahoma. The Relay For Life events are an activity where communities across the world join together to honor survivors of cancer, to remember loved ones who lost their lives to cancer, and to generate funds in an effort to fight the disease which often still has no cure. On Friday, September 27th, 2013, Narconon Arrowhead participated in the Relay for Life of Pittsburg County hosted at Sertoma Field in McAlester, Oklahoma. Community Relay for Life teams camp overnight at a designated local area such as a park, the fairgrounds, or a local high school. The team members take turns running or walking around a path or track as a fundraising activity. A Relay for Life event may last up to 24 hours in duration, so each participating team is requested to have at least one of their team members walking or running on the track at all times. The traditional Relay for Life event begins with an Opening Ceremony, followed by the Survivor Lap in which cancer survivors walk the path or the track in celebration of the victory over cancer. Next in the line-up of events is the Caregiver Lap done in recognition of those who care for cancer patients. Next is the Opening Lap where all participating Relay teams are invited to walk the path or the track together. This is followed by the Luminaria Ceremony, a beautiful lighting of Luminarias (or small sacks each with a flickering candle) in honor of all those affected by cancer. Throughout the night, the Individual Walking portion of the event continues in conjunction with family games, activities and entertainment. The Relay for Live closes with the Fight Back Ceremony, when participants take their final lap around the track or path, and pledge to help spread awareness about cancer. On Friday evening September 27th, a team from Narconon Arrowhead participated in the annual Relay for Life event of Pittsburg County in McAlester, Oklahoma. They were part of the overall community group effort which consisted of 13 relay teams and 123 participants whose combined efforts raised an estimated $81,288 on behalf of the American Cancer Society. The event was a very family-friendly activity with live music, games for the children to play and freedom to run around the Sertoma Field safely since it was fenced and had more than adequate security. The team described the event atmosphere as pleasant as well as emotional. They appreciated the personal stories of cancer survivors and a guest speaker who encouraged all those affected to keep hope and to live their lives to the fullest. It was open to all. Even if event attendees were not actually part of a Relay team, they could still come into the event at Sertoma Park free of charge, and participate. Local residents and guests were able to play games and purchase goods and services knowing that the proceeds were going to a great cause. The Mayor gave a speech proclaiming September 27th, 2013 to be the Relay for Life Day. Community participation was noteworthy with the local fire department, local banks and local daycares all in attendance, and with numerous local businesses sponsoring the Relay event itself. The Captain of the Narconon Arrowhead team spoke with the event commissioners and was welcomed and encouraged to attend their upcoming planning meetings for the next Relay for Life event. During the event, the commissioners also requested the team captains to introduce themselves. The team members, wearing their Narconon shirts to represent Narconon Arrowhead and its long history of community involvement and participation, were pleased to represent the organization at the Relay for Life event and are looking forward to helping out and contributing to the 2014 event. 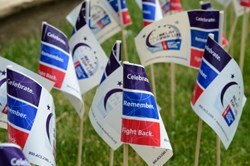 For more information on the Relay for Life go to: http://www.relayforlife.org/. For more on Narconon Arrowhead visit their main site at http://www.narcononarrowhead.org.